The Patriots were undersized in this one and I thought it was going to doom them all game long. But Mason didn't back down after ODU's relentless inside game was thriving early. They would counter the Monarchs tough inside possessions by hitting a three-pointer or driving to the basket. In the end the difference was really ODU's ability to grab an offensive rebound with ease that led to enough second chance points to put away the game late and sealed the 69-65 win. The Monarchs finished with 23 second chance points, had to win when you give up that on the defensive end. The Patriots also had no answer for Frank Hassell who really hurt them in the 2nd half. Cam Long and Luke Hancock paced Mason in the first half and saw Ryan Pearson score all of his 13 points in the 2nd giving Mason the lead for a stretch. As a whole the team was hitting outside shots but the Monarchs had an answer for every one of Mason's moves. The size advantage for ODU forced Larranaga to change his usual gameplan which was evidenced by the fact that Vertrail Vaughns didn't even enter the game. As a result Johnny Williams got more minutes and had two baskets that I am sure has fans asking why he isn't playing more. What to take from this game is that Mason can hang with just about any team they have to face. A guard heavy shooting team or a big front court team the Patriots appear ready for the challenge. It was good to see the fight in them after that lackluster performance we saw at Hofstra. They continue to shoot the ball well but sometimes it just isn't enough against fundamentally better teams. 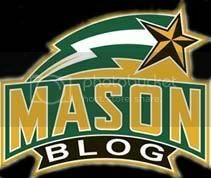 There isn't another team in the CAA that could beat Mason the way ODU did. Sure JMU has a solid front court but not nearly as many big bodies as ODU has. You have to hope they recognize how important rebounding can be on both ends of the court. Even though they lost that battle in this one they were definitely more aggressive on the boards then what we have seen. I was at the game and man was it a great one. We never backed down, and always had an answer for them. Cam Long was ON FIRE. He had an amazing reverse layup that was a highlight reel for sure. His 4-4 shooting from beyond the arc speaks for itself. Bottom line is we just couldn't stop them down low. It was second chance points and great low post moves. Their size and athletisicm was just too much down low. I really can't fault these guys, as I thought they played great. I was hoping Cam got the last shot as his stroke looked money all night. We had a chance at the end and that's all you can ask. We all know they just have to continue to get better so that we can make a run in the tourney! I agree with Ryan, J. Williams has a really good mid range jump shot. Everyone says he needs to play stronger down low, but man, what an asset to have. One day he'll get minutes and I think we'll all see why he was highly touted. Now let's break that NorthEastern win streak. It's a must win game now! Morrison continues to disappoint. What happened to Coach L's logic that if your man is out scoring you then the next man gets your spot? Hassell was unstopable it would seem. ODU got almost all of their points in the paint. Why did we never go to a zone and force them to shoot from the perimeter?